Everyone meet Molly. She is Erin's, Andrew's cousin, new doggie. 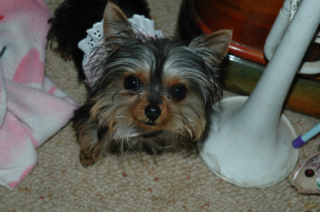 She is a teacup Yorkshire Terrier who weighs around 1 pound right now and will weigh 3 pounds when she is full grown. She is the smallest dog I have ever seen. 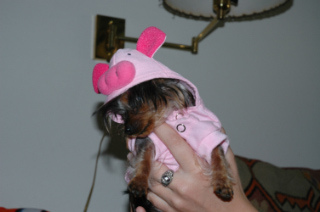 Erin dresses her in Chanel clothes and adorable pig Halloween costumes. Thank goodness another dog-dresser-uper has shown their face around the family. I was beginning to feel a bit lonely. Stay tuned for more cute pics of Molly.